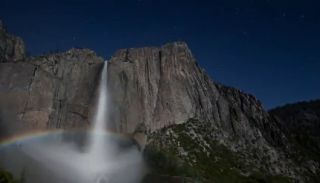 A rare moonbow, or lunar rainbow, is shown over a Yosemite National Park waterfall in this still from a park service video in July 2011. Moonbows draw out photographers during full moons at Yosemite, officials said. This month's full moon on Friday (July 15) may have been the center of attention for many skywatchers, but in California's Yosemite National Park, the full moon is just a tool for another amazing night sky sight: Moonbows. According to a video released by park officials this month, the time around full moons are the best time to spot nighttime moonbows, also known as lunar rainbows, over some of Yosemite's most famous waterfalls. "A lot of people don't realize that we even get rainbows at night in Yosemite," filmmaker Steve Bumgardner explained in the YouTube video, which he created for the Yosemite Nature Notes series. " If there's a full moon and the sky is clear, the moon, which is just reflected sunlight, is actually enough light to generate a rainbow at a place like Yosemite Falls." The moonbows are created the same way as rainbows after a storm: light hits water droplets and refracts in its component spectrum of different colors. During the day, rainbows are born when sunlight hits water vapor after a storm. But at many Yosemite National Park waterfalls, the spray from waterfalls and the full moon light combine in dazzling lunar rainbow displays. These moonbows are best seen during the spring and summer seasons at Yosemite, park officials said in the video. "Yosemite is a 24-hour park and its well-illustrated by the numbers of people who are going to go out all night long to take pictures of moonbows," said park ranger Bob Roney. Even famed naturalist John Muir wrote about moonbows over waterfalls, which he called "spray bows," in the 1800s, park officials said. July's full moon occurred Friday at about 2:40 a.m. EDT (0640 GMT). It was known by several names, including the Buck Moon, Hay Moon and Mead Moon. "From the night skies and Milky Way to the full moon rising to create these lunar rainbows, the beauty here doesn't end when the sun goes down," Bumgardner said. "You can have a unique experience 24 hours a day in Yosemite." "It has its own romantic sense to it," he said. "It's ethereal."